For technical reasons, from January 2015 we will separate the bulk of our news archives from this website to the archive website. The main website will only store the previous full 2 years of news (and some critical archives prior to this). The remainder (from January 2010) * will be transferred annually to the archive portal. Some key posts that are linked to core sections of the main website (such as our ‘Film Gallery‘ items) will be exempt from the above. 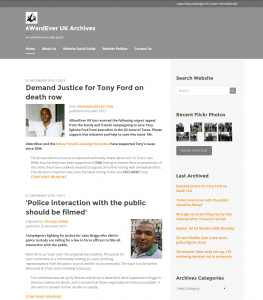 Items stored in the archive were previously published on the main 4WardEver UK website. Each year new items will be archived to this portal from the main website as required. Items are transferred in their original state and may not visually display in the same way due to differences in the formats of both websites. If the main website is offline for any reason, this may temporarily interfere with some components (images or downloads etc) on this portal. This is because some components are streamed via the main website. Some links may not open in a new browser window for the same reasons as above. To open such links in a new window right-click your mouse and select ‘open in a new tab / window’. Some links will take you back to items on the main website. These should generally open in a new browser window, but if not follow the guidance above. Some links to external pages / resources of third parties may not work. Websites sometimes move or delete content. Please direct any enquiries to the providers in question and not 4WardEver UK. For technical and legal issues please see our ‘Policy‘ pages for detailed information.